The Craft Barn is a community arts & crafts venue situated in the heart of the village of Hadfield, Glossop. 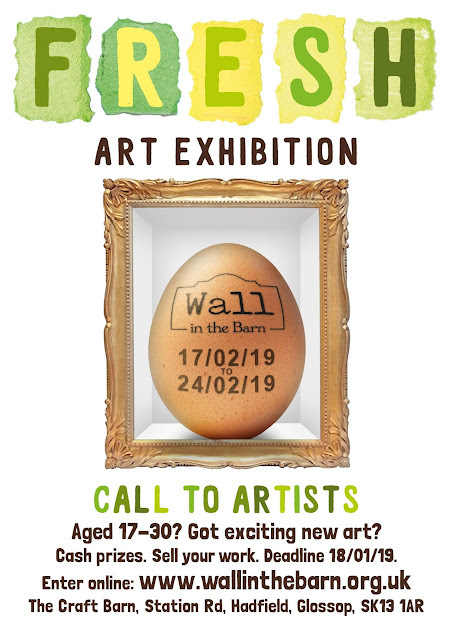 A former grain store and workshop, The Craft Barn has been beautifully restored to provide a bright & welcoming space for people young & old to enjoy their creative passions; be they novice or experienced. 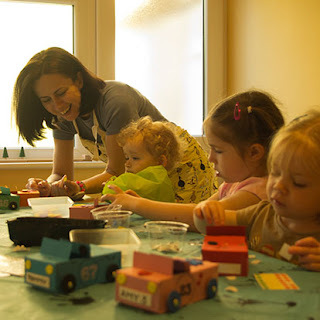 We offer a variety of creative experiences, & welcome new craft groups that wish to share their crafting passions. 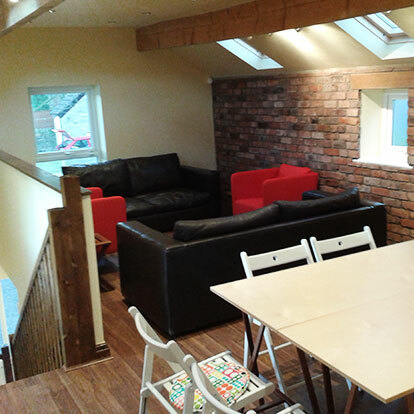 Downstairs at The Craft Barn is a fabulous space for children to splodge, stick and shape to their hearts’ content in daily arts and crafts activity sessions. Each week a different theme will spark the youngsters’ imagination. Our hour-long craft sessions are available to small groups children to ensure lots of creative fun. 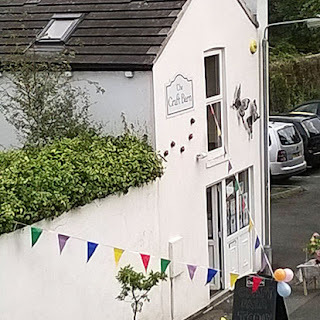 Upstairs at The Craft Barn is a lovely light room available to hire for adults to meet and enjoy their crafting passions, and is where we hold our adults’ craft workshops, groups and courses. The room is a flexible space with a combination of comfy sofas and armchairs, and more practical tables and chairs which can be arranged to suit your needs. 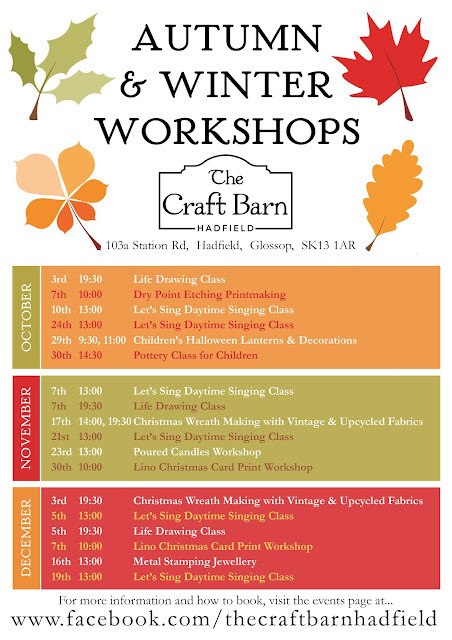 We have loads of fantastic workshops on offer at the Craft Barn this year for adults and children. Visit our facebook events page to see details on how to book, or contact us. 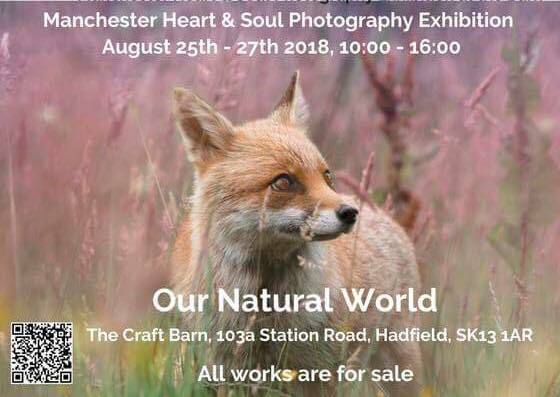 Following on from last year's successful exhibition, which raised money for the victims of the Manchester bombing, members of the Manchester Heart and Soul Photography Group bring you their second exhibition featuring images capturing nature, landscape and wildlife from around Manchester. Please pop along and say hello! Our Summer Timetable for 2018 is finally ready and is packed full of exciting crafty activities and arty workshops for children of all ages! 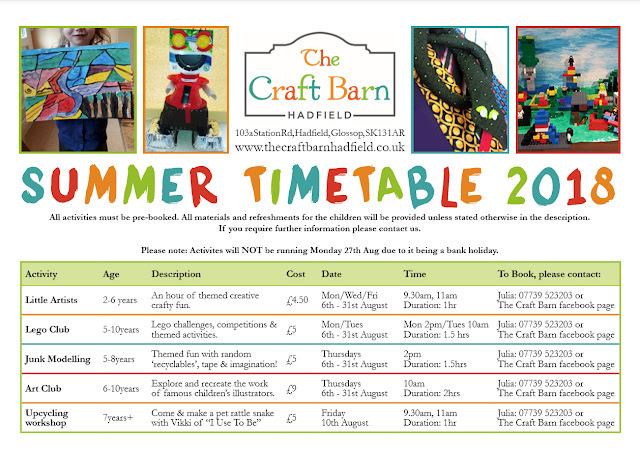 Have a look at what's on offer at The Craft Barn in Hadfield then get in touch with us to book your child's place. Keep an eye out for new additions closer to summer. Places will fill up fast so make sure to book in advance. Click on the image to download the PDF. 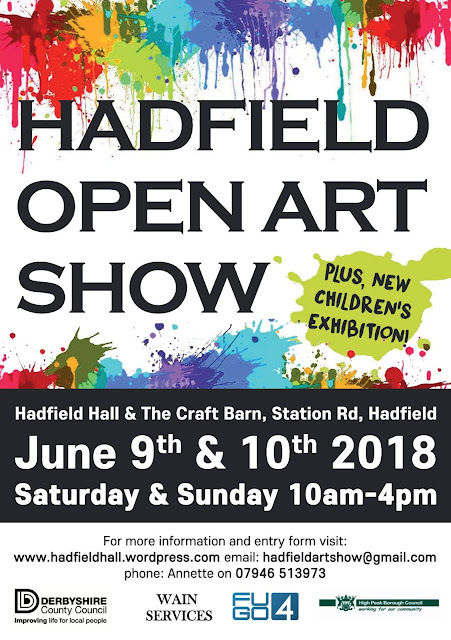 Our eighth annual exhibition held at Hadfield Hall (adults) and The Craft Barn (Children) will be open to the public on Saturday 9th and Sunday 10th June from 10.00am to 4.00pm, with the preview on Friday evening 8th June at both venues. Art work by adults, at Hadfield Hall, will be judged this year by Holmfirth Artist Pippa Ashworth and by Photographer Adrian Lambert. 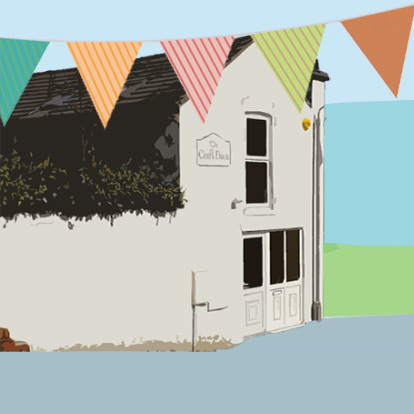 Children’s work, at The Craft Barn, will be judged by Glossop’s Chellie Carroll, artist and illustrator. 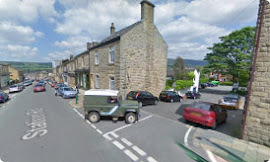 As in previous years, prizes will be awarded for work that the Judges consider to be of highest merit, and People’s Prizes (adult’s and children’s) will be chosen by public vote. 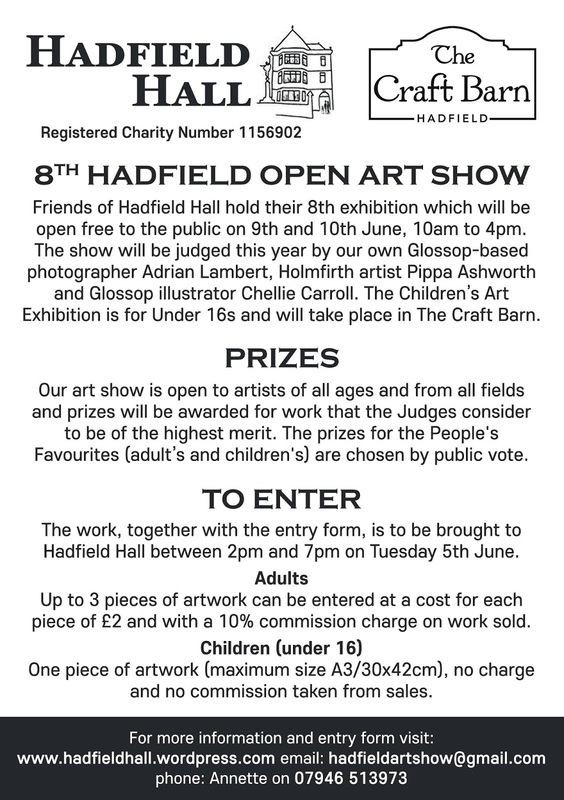 You can bring work for inclusion in the show to Hadfield Hall on Tuesday 5th of June between 2.00 pm and 7.00 pm. Children’s artwork should be either framed or mounted on card with a cord for hanging. The labels provided with the entry form must be completed and then stuck onto the back of the piece. For reasons of copyright all artwork should be original or, if it has been copied, the source must be acknowledged in the title. Unsold Artwork must be collected between 4.30pm and 6.00pm on Sunday 10th June, after the show. All work is left at your own risk; the hall will be staffed whilst it is open to the public. We do hope and expect to show all work submitted, but reserve the right to hold back some pieces if the work is considered unsuitable or if there is not enough space to display everything.